On our recent family trip to Nepal, I was initially concerned about how my kids would get on. Usually they lead quite separate lives. Our daughter, Lily is 10 and is into dancing, friends, shopping and watching Dance Moms. Our son, Jesse is 15 and likes surfing, spending hours on his Macbook, watching Mature-rated movies and constructing things in our back shed. They don’t fight but they also don’t do a lot together. For a lot the trip there was no internet available, certainly no television and many hours to fill once we had finished trekking for the day. As the trip progressed though, they started to play cards. They taught and learnt new games from the Nepalese porters and spent countless hours learning card tricks and making card towers. Together. Hours of playing “Dumble” – a Nepalese card game were spent with the porters and guide. 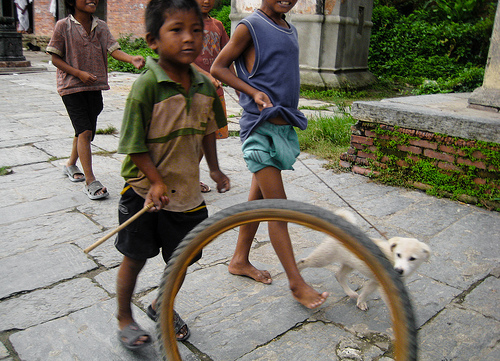 My daughter also started to notice and ask about the games the Nepalese children were playing. What’s the game where they’re throwing rocks in the air? Jacks! As a child I spent many afternoons playing with plastic knucklebones – perfecting my throws and just whiling away the time until I could get to school and compete. We collected up some suitable rocks and we were off. Similarly marbles are popular in Nepal. Again, she had never seen kids playing marbles and we watched excited and rowdy groups of boys knocking over their marbles, shouting at each other over and disputes and crowing with delight when they won some marbles from their opponents. Sometimes they didn’t have marbles and they just used small rocks. Popular with the girls was hopscotch which we had played at home on the footpath. We also saw a game of elastics – using old string, and of course the wheel and the stick game that seems to be played in developing countries all over the world. In Bandipur, there was a village square which was blocked off from traffic. When school finished we saw children running home to change into play clothes to quickly join the others to play. This went on until after dark. All night we could hear a cacophony of children’s shrieks of laughter – all playing in groups, and as far as I could tell, completely unsupervised. These kids had me crying with laughter. There are a lot of ponies in their town as there are no roads so the ponies are used as transport. These two were taking turns being the horse and the horse wrangler which involved lots of smacks on the bottom with a stick. In another conversation Lily mentioned to me that they aren’t allowed to do cartwheels at school anymore. Too dangerous. What? Watching the Nepalese kids play with such zest and enthusiasm brought me to the realisation of how much children’s play here in Australia has changed over the space of just one generation. Activities are scheduled and there is very little time left for just playing and whiling away the hours. Of course most Nepalese children don’t have the opportunity to participate in these “enriching” activities and that’s also an issue but I do think we need to somehow give our children the opportunity to re-learn the valuable and important art of play. Lily has never been a reader. She has a room full of books but she has never finished one of them. This trip she picked up a book and didn’t stop reading until she finished it. She then related to me all the funny bits of the book that she liked. I remember growing up by the beach in the Philippines with only 2 channels on TV, and no such thing as the I Internet. We were always outdoors playing with the other children, bicycle-riding all over the place or racing to the deep end of the sea, exploring towns, etc. When our parents dropped us off at the mall, we ran straight to the bookstore and read and read to our Heart’s desire. My little sister was born and grew up in NYC and her childhood is soooo different. I can’t seem to fathom how some kids can sit home in front of a tv or a computer all day. It’s definitely a different generation, however I hope to expose her to how other children and teenagers live in other parts of the world like you did to your kids. It really has changed. I think travel is a great place to start,and even at home not over-scheduling kids so that they forget how to entertain themselves without using a screen. Hello I recall my days spending hours till dark playing these games. Pebbles, marbles, rubber string etc. So nice and pleasant memories of childhood.